This is a very magnificent large-sized wardrobe, created to suit the needs of people with style. It consist of 4 adjustable shelves, interior drawers and shelves placed simultaneously. 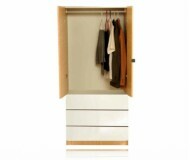 It provides adequate space for shoes as well as large-sized wardrobes. It is the perfect all-in-one solution for a large room. It maximizes space in the bedroom because additional storage is not usually required. 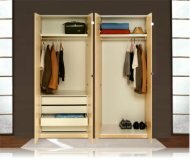 This sophisticated and modern wardrobe is sturdily built to ensure maximum durability. Its streamlined styling will blend effortlessly with all your exiting furniture or vintages collectibles.